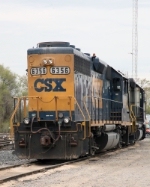 Description: CSX 8107 is the last trailing unit on a southbound train out of Florence Yard, S.C. Description: Three styles of CSX paint, YN1, YN2 and YN3. Description: Sitting in the Rougemere Yard. Description: Conrail Local LV-4 (Livernois Yard) is spotting cars at the Ferrous Scrap Yard on John Kronk Street in SW Detroit.